The beauty about a lot of graphic novels and comics these days is that they provide reprieve from the intense novels we all love to leap into. There’s something special about a riveting Thomas Harris novel, but there’s a unique sensation when you can open the pages of a piece that gives you chills while carving a massive smile on your face. 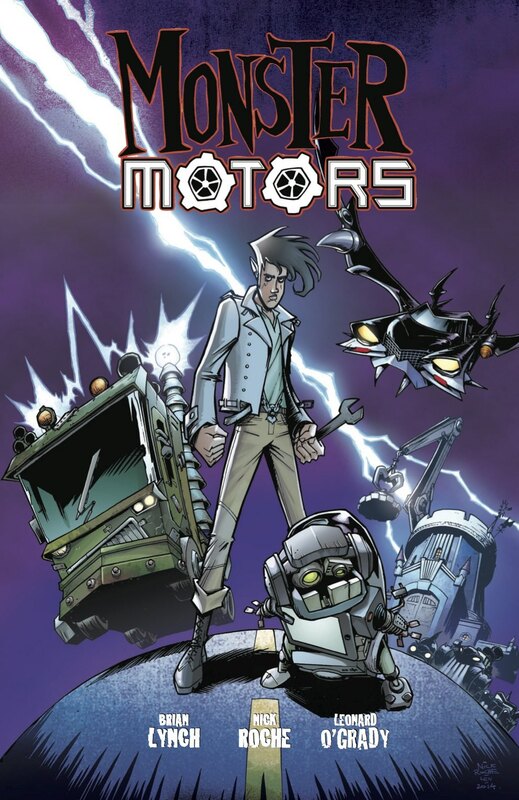 Monster Motors leaves the reader with perma-grin, but we’re also able to genuinely appreciate the creativity and absurdness of it all. It’s about a young gent by the name of Vic Frankenstein. Vic isn’t to piecing together bodies and building undead monsters however, he’s a mechanic… capable of building robots that absolutely rock and prove far more productive than the aforementioned undead monsters. But when Vic buys a junkyard in Transylvania, his skills are going to be put to a test he could never imagine… because there’s a vampire car locked in the garage that siphons the life from all functioning cars, eventually gaining the power to escape the junkyard and wreak havoc on the town. Can Vic’s pure genius enable him to come up with a plan to take down Cadillacula once and for all, or is there an altered destiny in store for the youngster who’s new in town? On our hands is an engaging book that pays homage to classic Universal monster features Frankenstein and Dracula. And every tip of the cap is handled with humorous but respectful nature, and as a diehard fan of vintage Universal monsters that comes as a very welcome quality. Brian Lynch’s story is engaging and fun while Nick Roche’s artwork pops off the page. This is another strong duo turning out slick material for IDW Publishing. Leonard O’Grady’s coloring works as a fine compliment to the two, making for a trio that fell into the perfect project. If you’re interested in taking a breather from the wildly intense, take a look at Monster Motors. You’ll no doubt be ingrained in the book, which may also summon a strange sense of nostalgia given the originality of the idea and the familiarity of the setting and villains. It’s a superb read that anyone who gets a kick out of comics and graphic novels is bound to dig.